Bael tree is held sacred by the Hindus. The history of this tree has been traced to Vedic period (2000 B.C. -800 B.C.). The plant: A medium-sized, deciduous tree, having strong axillary thorns. Leaves trifoliate, stalked, alternate; leaflets oblanceoiate, crenate, gland dotted; middle leaf is stalked and larger while the later one’s are sessile. Flowers greenish, fragrant, sweet scented, in axillary panicles. Fruit is globose with woody shells, with yellowish rind, seeds numerous oblong, compressed, embedded in orange brown sweet gummy pulp. Parts used : The ripe and unripe fruits. Fruits are globose and the pulp is mucilaginous, aromatic, sweet and astringent. Dried slices are having on the outerside a smooth, greenish-brown shell enclosing a hard orange brown gummy pulp, in which cells and seeds may be seen. Dried pulp has a mucilaginous, acidic and slightly astringent taste and have agreeable aroma. Fruit contains marmalosin, young bark contains coumarin, and umbelliferone; old bark has umbelliferone and coumarin. Leaves are having essential oil, consisting of a and B-phellandrene. Matured bark contains fragrine, umbelliferone marmesin, sterols and triterpenoids. The leaves contain 0.6% essential oil mostly compound of d-limonene (CCRAS 1990). Properties and uses of Bael tree: The Aegle Marmelos roots are sweet, astringent, bitter and antipyretic. They are useful in dyspepsia, dysentery, diarrhoea, especially for patients having diarrhoea alternating with spells of constipation, stomachalgia, cardiopalmus, uropathy, gastric irritability in infants, vomiting, intermittent fever, vitiated conditions of vata, seminal weakness, and swellings. The leaves of Bael fruit are astringent, febrifuge, laxative and expectorant, and are useful in inflammations, ophthalmia, deafness, catarrh, diabetes and asthmatic complaints. The unripe Bael fruits are bitter, acrid, sour, astringent, digestive and stomachic, and are useful in diarrhoea, dysentery and stomachalgia and helps in improving appetite and digestion. The ripe Bael fruits are astringent, sweet, aromatic, cooling, febrifuge, laxative and tonic, and are good for the heart and brain and in dyspepsia. Sweet drinks (Sharbats) prepared from the pulp of the fruits are useful as soothing agents for intestines of patients who have just recovered from bacillary dysentery. The antibiotic activity of the leaf, fruit and root of Aegle marmelos plant has been confirmed in some recent experiments. Fruits: May-June of the following year. Ayurvedic Preparations: Dasmula-taila, Dasmularishta, Bilvachurna, Gangadhara-churna, Amritarista, Chyavana-prasa, Mahanarayana taila, Dhanya Panchaka Kvatha, Pusyanuga churna, Vatsakadi Kvatha. 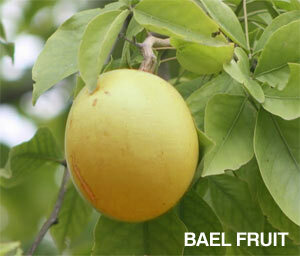 Cultivation of Bael (Aegle marmelos) tree : Propagation is through seed which should be taken from ripe fruit on the tree. The seed does not keep well and those in fallen fruits are apt to be useless for sowing. The growth is slow and trees don’t start to fruit till they are 5-8 year’s old and are not in full bearing till these are 25-30 years old. The tree produces root suckers rather freely and these can be used instead of seedlings. Root suckers taken from a good tree are much preferred to seed from an unknown source, if large fruited plants are required.